Walking into the Hastings Highlands Public Library on any given day, it doesn’t take long to notice that it is much more than just a place to borrow books. It is true that the library does harbour an exceptional collection of reading materials, audio books, and DVDs for all ages, but there are many more reasons for people to visit the library in Maynooth these days, said library CEO Rod Moffitt. By offering an ever-growing list of programs for all age groups, making space available for recreational and cultural activities, and providing learning resources such as computers with high-speed internet, he said the library actively bringing people together and strengthening the community. “I see the library as a community hub, and as a place where people can come together to share ideas,” said Moffitt. Speaking to the value of the library as a community hub, Moffitt said what he enjoys most about working at the library is seeing people make these connections while using the facilities. “Hastings Highlands Public Library has open doors,” said Moffitt. Moffitt said his ongoing goal is to find new ways to make the library accessible for everyone to use and enjoy. If a community member has an idea for a program, he said they are welcome to drop by the library to fill out a proposal, which he will then take to the board for approval. By working with the community to develop programming that encourages lifelong learning and the advance of knowledge, he said residents are able to make the library a more welcoming space for everyone. “With regard to programming, we look for different programs that will appeal to people of all ages,” Moffitt said. The many partnerships established with individuals and community groups contribute greatly to making the library a special and more inclusive place where everyone can feel welcome, Moffitt said. 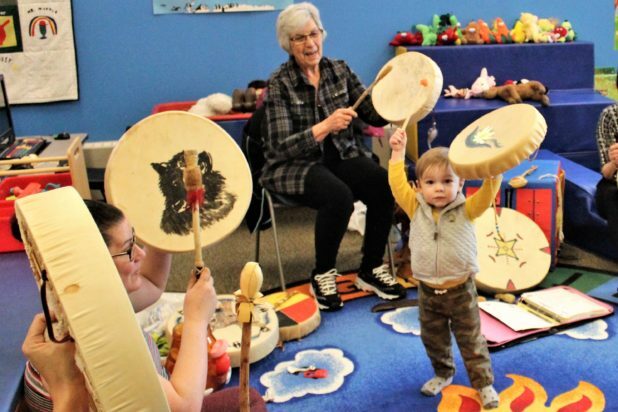 Acknowledging the substantial Indigenous community within Hastings Highlands and the surrounding area, he said the library has been working with members of the Kijicho Manito Madaouskarini Algonquin Nation and the Métis Nation of Ontario to connect people with Indigenous culture, nature and each other. One example of this, he said is the “Come Drum With Me” program hosted by Algonquin Elder Ada Tinney each week. Moffitt said the program is designed for pre-school aged children between the ages of 0 to six years old, and is held in the library’s children’s area from 10 a.m. until 11 a.m. every Thursday. Hastings Highlands Public Library has several other programs and activities planned for almost every day of the week that are worth noting, Moffitt said. The programs are designed to appeal to people of all ages, he said. To name a few, every Tuesday the library offers: a program for children called Reading, Rhyming and Running Around at 10:30 a.m.; there is a group that plays Bridge at 1 p.m.; and a drop-in program for teens called the Community Hub Youth Group that meets at 4 p.m. There is also live music in the library each Friday from 10 a.m. until around noon, that gives local musicians a chance to perform some of their favourite songs with their musical friends. To foster inclusivity, Moffitt said the library also offers American Sign Language courses on Saturdays from 11 a.m. until 12:30. On the first Friday of each month, he said there is also a Movie Night and potluck dinner starting at 6 p.m. For only $5, Moffitt said people can enjoy recently released films and share a home cooked meal with their friends and neighbours. The library also provides space for a book club that gathers to discuss a different book on the first Thursday of the month from 1 p.m. Until 3 p.m. In addition, Moffitt said on March 28 there will be a “Hugelkultur” gardening workshop at the library from 1 p.m. until 3 p.m. facilitated by Leslie Eden and Leslie Hysert that will focus on organic gardening, the growing season and gardening on hills. To promote sharing and food security in another way, he said the library will open its seed library in April. Moffitt said this initiative is intended to enrich people’s gardens through the sharing of seeds. Anyone is welcome to pick up or drop off seeds for the program, however all the library asks is that if patrons take seeds they save them after the harvest and return some to the library in time for the next growing season. According to Moffitt, the diversity of volunteers and patrons using the space and participating in the programs is a testament to why the library is such an important part of the community in Hastings Highlands. “When people from different walks of life are able to connect a lot of people can help each other with whatever they are dealing with,” said Moffitt. The library is open on Mondays, Fridays and Saturdays from 10 a.m. Until 2 p.m.; Tuesdays and Thursdays from 10 a.m. to 6 p.m.; Wednesdays from 10 a.m. until 4 p.m.; and closed Sundays. To keep up to date on all that is going on at the Hastings Highlands Public Library, and for a full schedule of programs visit them online at: www.hastingshighlandslibrary.ca.